Vauxhall Spurs have had a solid start to its 2018 American Legion ‘A’ baseball season, starting off with a 3-1 record. The Spurs kicked off its season with a home doubleheader at Jets Stadium last Wednesday, swinging the bats right away with 10-0 and 12-11 victories over Fort Macleod Royals. Nevertheless, with the tying run on third base, Dax Wandler was able to close the door to a Royals comeback and earn the save. Being able to knock in 22 runs in the first two games of the season for the Spurs was pleasing to Parsells, seeing contribution right down the lineup. 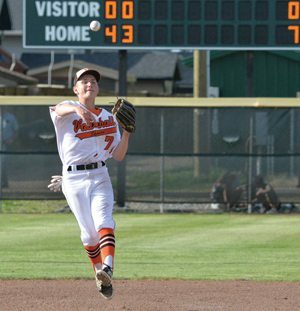 It was a split for the Spurs when they traveled to Montana to take on the Tri-County Cardinals on Saturday, starting off with a 10-7 loss. “We left a lot of pitches up in the zone in the first game. We couldn’t get it down and miss barrels. They swung it well, a lot of credit to those guys. We had to throw a couple more guys than we would have liked,” said Parsells. The second game of the twin bill was a close game, 3-3 going into the last inning, before the Spurs blew things open in the 10-6 win. “We bared down and our bats finally came alive. We put up seven in that last inning and we were able to get out of Montana with the split,” said Parsells. The Spurs took on the Lethbridge Miners at Spitz Stadium in Lethbridge on Tuesday, with results unavailable at press time. The team is at a tournament in Helena from June 8-10. “I liked our effort all week long and we played the game hard. We did struggle to keep our head clear in Montana which we will have to work on going forward,” said Parsells.